I knew from the start that I wanted to have a tropical, Lilly Pulitzer-esque theme and when Target came out with these flamingo sheets in their Pillowfort line I was sold. I also have a special love for this rocking chair because it was the one that I used as a child and my mom used when she was a little girl, too! The monogrammed pillow was a gift from my grandma when Lucy was born. I ended up painting Lucy's dresser a pretty coral shade and left the handles gold. It's a cute little mid century modern piece that we've had forever and I'm so glad I was able to give it a new look. The gallery wall is a combination of dollar store frames that have been spray painted and a few items from Hobby Lobby. I made all of the art prints and added a Lilly print and some family photos. The curtains are also from Target and I love the sheer look and mint hue paired with the coral accents. Her room was still feeling a little empty so when Lorena Canals asked me to try out one of their machine-washable rugs I thought that would be the perfect addition! I was so right! The ombre is so beachy to me, and the mint color is a perfect match to her curtains. I LOVE the way this rug just completely pulls the room together and completes the look. And those tassels, are you kidding me? I didn't think it could be more perfect, but it can! Lorena Canals rugs are completely machine washable, meaning I can roll it up and toss the whole thing in my washer. No spot cleaning and no worrying about kids messes ruining my rugs! I also appreciate that Lorena Canals uses natural dyes and contain no VOCs like other carpets and rugs; super important when little ones are close to the ground and putting everything in their mouth! Even better, proceeds of these rugs support the Sakula project and provide schooling for children in India where they're made. I love supporting companies who give back! Are any of you Disney lovers? If you're a true Disney fan you may have noticed a little something in that gallery wall ;) Let me know if you find it and know what it is! So cute! I love the colors! I did not know that washable rugs exist! This is something I need in my life! I'm about to literally throw one away that the children have gotten so dirty it's just ruined & I was actually discussing with my dad the merits of taking one of their play room rugs to the car wash & hoping for the best today! Haha, your ears must have been burning! I love our rug from Lorena Canals. The color has held strong and it is soft as ever. Kids are the reason we can't always have nice things, am I right?! I just adore that dresser! Great job! Thanks, Becky! Foam rollers are the secret weapon! Hi! I'm actually de-doing my little girl's room (we didn't know what her gender was before she was born so its currently green and gray gender neutral). I was inspired by Target's flamingo sheets and I'm going to cut down a parakeet comforter. 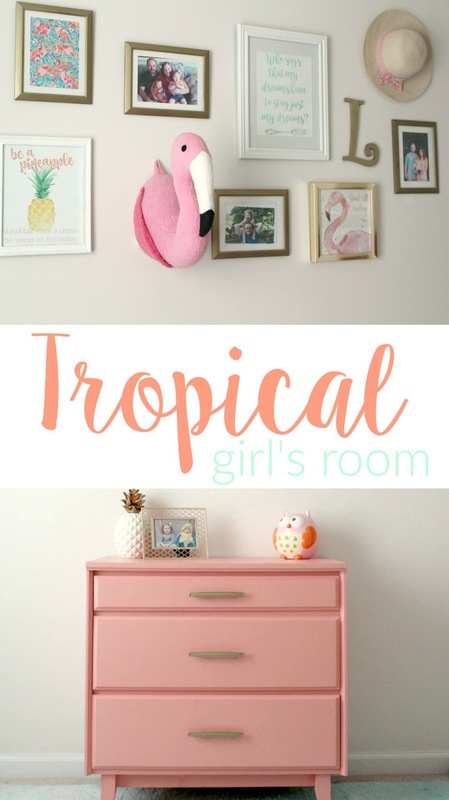 I found your site via pinterest searching for a flamingo head to put on her wall. I saw that you wrote that it came from Hobby Lobby. I don't have one too close to me to just go and look and the link showed it was unavailable. You bought it from there, correct? You didn't make it? Thanks! Cute room!! Thanks Sara! I did buy it at Hobby Lobby but it was back in the summer of 2016 so it's probably sold out now :( I would check Etsy! Best of luck!